Tucked away in the side streets of Tennyson, an inner city suburb in Brisbane, Austral Plywoods is an institution, a leading supplier of premium grade Australian plywood, with origins dating back to 1925. Using 100% Hoop Pine, sourced from HQPlantations, a Responsible Wood certified softwood plantation in South East Queensland, Austral Plywoods manufactures a wide range of panel products, specialising in marine plywood and appearance grade plywoods. For Austral Plywoods, specifiers of plywood for interior application is the main target market. Stocked by wholesalers in Australia and New Zealand, Austral Plywoods targets architects and interior designers and has been involved in a number of notable projects including the Brisbane Supreme and District Courts, Perth Arena and Melbourne Recital Centre. Indeed the supply of the Hoop Pine resource, pruned and harvested, plays an important role in supplying Austral Plywoods with superior grade product for manufacture. 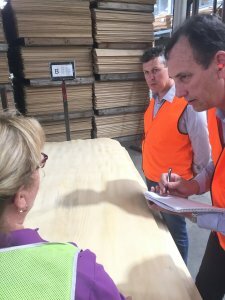 For Austral Plywoods, Responsible Wood is more than just a trust mark. Through Responsible Wood Chain of Custody it provides Austral Plywoods with a licence to support responsible forestry. Verifying the origin of superior grade Hoop Pine at its source, in the forest, maintained as part of the manufacturing process. Through Responsible Wood, Austral Plywoods provides customers with the highest grade plywood; ensuring that premium grade Hoop Pine is available now and into the future. 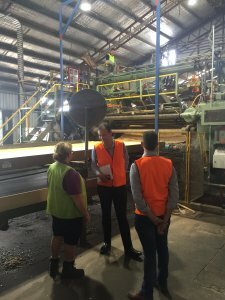 And with that, Austral Plywoods opened its doors for Responsible Wood Directors Mark Thomson, Willie van Niekerk and Jason Ross, Marketing and Communications Officer, to tour it’s facilities and meet with staff. “Competition in the market is strong with imported product competing against local manufacturers,” according to Stuart Matthews. In such a competitive market place, forest certification plays an important role in differentiating sustainable product from the rest. “Responsible Wood certification is an important consideration. Whilst there are other environmental logos, the Responsible Wood ‘trust mark’ is the only logo that verifies that the plywood timber originates from a forest that meets the Australian Standard for Sustainable Forest Management,” Scott Matthews said. Verifying the origin of timber in the forest is one thing, but ensuring that manufactured timber maintains high levels of certified timber, is a key consideration for all environmentally conscious purchasers. “When specifiers and builders source plywood they should ensure the product is Product Certified PAA, first and foremost. They then should make sure the product is processed and manufactured by an identified organisation that continues the commitment through Responsible Wood Chain of Custody,” Mr Thomson said. Austral Plywoods is one of 250 companies involved in the Responsible Wood Chain of Custody for Forest Products. Responsible Wood Chain of Custody ensures that processors, manufacturers, merchants and retailers source forest products from the sustainable origin and maintain the link through the supply chain. More than 11.4m hectares of certified forest is now covered as part of the Responsible Wood Sustainable Forest Management certification scheme making it Australia’s largest and most diverse forest certification scheme. For more information about Responsible Wood Sustainable Forest Management, Chain of Custody for Forest Products or Responsible Wood certification more generally please contact Responsible Wood or visit the Responsible Wood website. For more information about Austral Plywoods please visit the Austral Plywoods website.